Beautiful and Exquisite Home!! Must Reserve!! Beautiful 3800 sq ft. Home with 4 bedroom 3 bathroom, with a Sunroom, and a place for a dog to run around with fenced yard, fireplace, 3 car garage but not accessible. Chef kitchen with large pantry and laundry. Home equipped with alarm system. From the outside this house looks impressive. It has been built with red bricks and tan stucco. Long, wide windows allow enough light to enter the home and have been added to the house in a mostly symmetric way. It also has a family room, a snug dining room. The single floor home is very well laid out with a open floor plan. The ceiling is high and triangular and crown molding throughout the main living areas as well as the master bedroom. The house itself is surrounded by a wooden fence, with mostly grass and plenty of space for children to play. 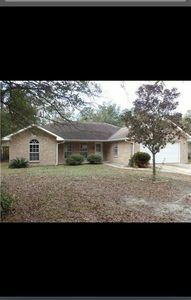 Welcome to a lovely spacious 3 bedroom home located in Ocean Springs MS. Less than a mile from the gulf coast, sitting on an old golf course that's was closed because of Katrina. The property has a small river bed in the back yard, very large porch with a hammock and patio furniture for you to relax and enjoy the peace and quiet. 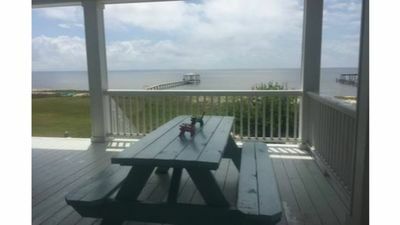 This property is also just 20 minutes from Biloxi casinos, and all the fine restaurants that align the beaches. ***SPECIAL SPRING RATE UNTIL APRIL 10th*** Please note; it is best to first send us an inquiry first (before your booking application) so that we can send you a rental application. We will need the signed rental application returned before approving the booking. Thank you! From its stellar namesake fountain welcoming over one acre of Gulf front on the Mississippi Sound, to its grand symmetry, this extraordinary 5 BR estate provides all the comforts and amenities one would come to expect from a home featured prominently in several magazines. This 3 story estate features an elevated first floor over 20 feet above ground with a wraparound veranda with unsurpassable views of the Mississippi Sound and Gulf Shore Islands, eloquent yet comfortable living space, large elevator, a huge 1st floor gourmet kitchen, 2nd floor efficiency kitchen, 5 large bedrooms, wraparound porch, stunning veranda/balcony with outdoor dining for 8+, classic English library, several TV areas, den/family room, surround sound, numerous fireplaces, pool, athletic and game room, kayak rentals and so much more. 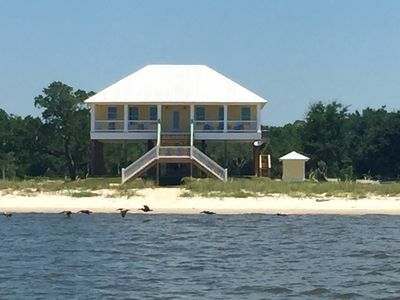 The Dauphin Island Room (Master BR) is on the first level - includes a CA king poster bed with TV, fireplace , ceiling fans and elegant bath and private john - spotting scope with a view from within of the islands and private access to the veranda. The gourmet kitchen is comprised of a 5 burner gas stove, pot filler, food prep station, immense island with sink, 2 dishwashers, 2 wine coolers, double ovens, warming bin, side by side fridge, microwave, all needed appliances, dishes and kitchen gear and much more. 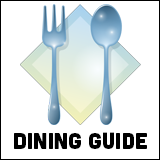 There is also a large dining room overlooking the Gulf and two separate marble bars complete with ice maker and sink. The business office overlooks the Gulf including desk, large computer monitor/HD TV, printer, shelves and everything you need to run your company while relaxing in luxury. There is a guest bathroom and laundry in the middle of the house. The outdoor wraparound Gulfview veranda includes a large dining table as well as telescopes, many additional comfortable chairs and tables positioned throughout the wraparound porch. The offshore islands feature prominently in the veranda ocean panorama. The second floor has 3 additional large bedrooms, two full marble bathrooms, one large family den, a second efficiency kitchen, an English library with desk, a workout facility and game room including a “pro style” fussball table, Lifecycle, iFit treadmill and bow flex machine. The Petit Bois Island Room is French themed with a queen bed and large wooden headboard, dresser, Lazy Boy recliner, closets, mirror, chair and French themed artwork. The Ship Island Room sleeps four with its queen bed and headboard, dresser, futon love seat/bed, chairs, closets, and Paris pictures throughout. The Horn Island Room sleeps six and overlooks Horn Island with bunk beds, two XL twin beds and a country style double bed that features a comfortable slide out bed. The twins have a foam bridge that can make into a queen size bed if desired. There are also spotting scopes and several closets. There is also a balcony overlooking the beach from the second floor. The large Round Island Room on the third floor has a private stair entry including an exceptional “circular room” with a queen bed, dresser and numerous storage cabinets and expansive counter tops. There are also two lazy boy recliners and a ping pong table and tv. The Chandeleur Island Room features a matching rattan loveseat, sofa, chair with hammock, two bars with sink, matching floating marble countertop table, ice machine, 50” TV, table and chairs, spotting scope and a panoramic view of the Gulf Islands. The Cat Island Room is an activity oriented room with a fireplace, Lifecycle, fussball table, rowing machine, bow flex gym, sports themed wall art, spotting scope, counter top and storage compartments and an ironing board. The stunning classically designed old English library is a one of a kind step-back-in-time room in the center of the second floor. With its cherry wood walls, floors and shelves, this beautiful room features wall to wall shelves with books, a classic desk and chair, Mardi Gras masks and antique wall art. The estate has internet and Bluetooth sound throughout as well as many digital TVs. The veranda and every bedroom and athletic/game room has a high powered telescope for viewing the islands and sea life right outside your door. The ground level has a gated (resistant current if so desired) swimming pool, pool chairs, table and umbrella and extensive parking beneath the home and within the circular driveway. There is also a large elevator that serves the first two floors for your convenience. The front yard features a beautiful fountain (thus “Belle Fontaine” Drive). 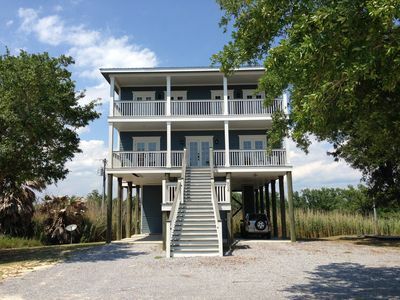 The large back yard is perfect for play, fishing and crabbing off the bulkhead or beach nearby. This estate’s construction is built like no other at 31 ft. elevation and significant hurricane and storm protection with a large generator. In fact, this home was built to be storm and hurricane resistant from its beginning on the Naval architect’s drafting table. 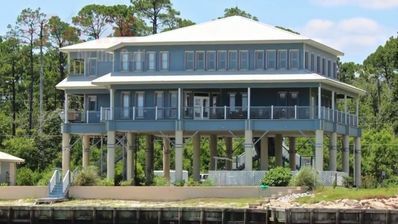 The exterior has over 100 ft of water frontage and exceptional views with access to the Mississippi Sound. Please Google “5105 E Belle Fontaine, Ocean Springs, MS 39564” for more information including more pictures and an interior video of this luxurious estate as well as a revealing interview with the naval architect who designed it. Come stay and enjoy our southern hospitality in one of the most beautiful and well designed estates on the entire Gulf Coast! This house is meticulously designed with brand new interior furnishings. A large gorgeous coastal kitchen, 3 bedrooms, each having its own bath. Views of the gulf from the living area and master bedroom. 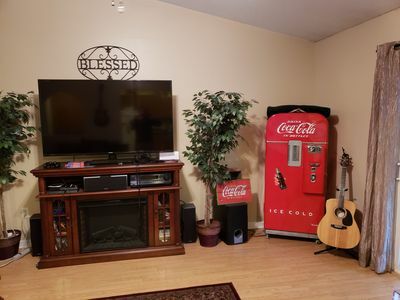 You will love the peacefulness of this location with very little road traffic. Watch the dolphins jump and the pelicans soar from our beautiful white sand beach. Laundry, high speed internet, Directv, big screen TV are just a few of the amenities offered. 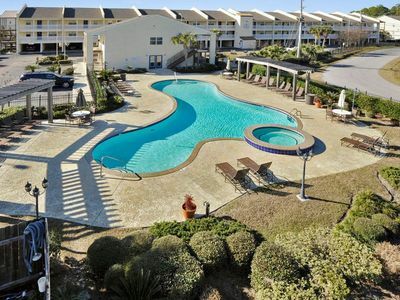 This rental is sure to not disappoint someone looking for that vacation to just RELAX!! Great rustic retreat with private beach on the Gulf of Mexico in a single-family residential neighborhood. Featuring 3 bedrooms, 2 full baths, open living area. This home sleeps 7 guests comfortably. Fully equipped kitchen with granite counter tops. 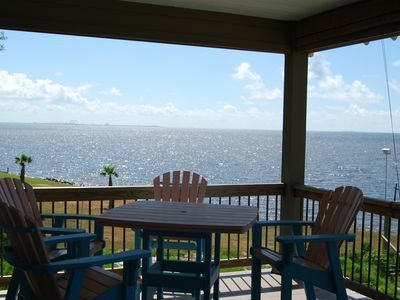 Living area and balcony have spectacular views of the Gulf of Mexico and Horn Island. A perfect getaway for those seeking a quiet place to kick back and relax. 'Nowhere is life richer than where the land and water meet.' 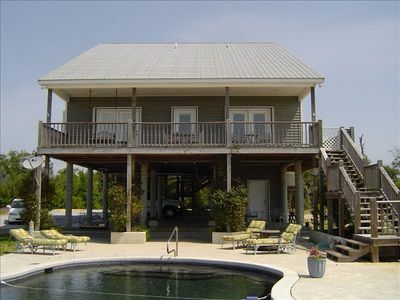 This beach front home is located on the only natural beach in Mississippi and is a nature lover's retreat. It is secluded, quiet and peaceful and allows you opportunities for fishing, boating, beachcombing and sight seeing. Your sole appointment for the day will be the magnificent sunset from the wrap around porch, private cabana, salt-water pool, or a walk along the private beach. We are located only 20 minutes from the casinos and 15 minutes from the old charm of downtown Ocean Springs, with its unique shops and numerous restaurants. For golf and tennis lovers, there are several first-class courses and courts nearby. For the nature lover, there is Gulf Island National Seashore Park with its many hiking trails and island chain. The brand new 2011 built home is a great place for families to relax and enjoy the scenic ocean views that await you from every room in the house. Whether you are sitting out by the pool, surf fishing, floundering, or simply building a sandcastle, you are sure to collect some cherished memories from your delightful stay. If you enjoy entertaining, there is a comfortable family room and completely equipped kitchen with stainless steel applicances and granite countertops. 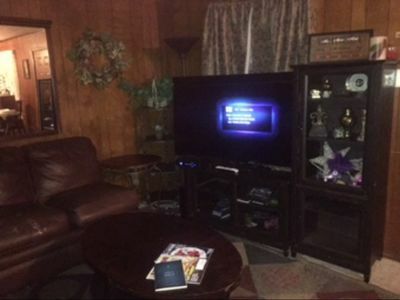 Several flat screen televisions with Direct TV are located throughout. Table seating for 4 and kitchen island seating for 6, complete the open family/kitchen area. 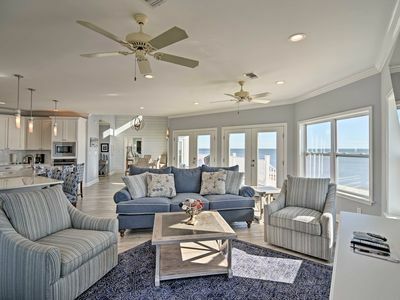 From this inviting area you can take in spectacular views of Horn Island and the Gulf or step out on the spacious deck to expand your entertainment experience. The elegant master suite is equipped with a king size bed, 2 large closets and many views of the beach/Gulf. The master bath has a separate shower and tub, granite countertops, and ample space for dressing. There are 2 guest bedrooms. Both rooms have comfortable queen size beds and each have their own closets. These two rooms use a shared bathroom with granite countertops and tub/shower. If you are interested in fishing, boating, golfing, or tennis, let us know and we can 'hook' you up! This cottage style beach house is one of a kind and will leave you wanting more! 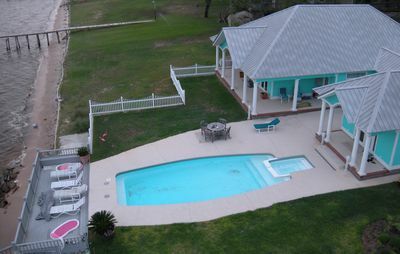 Keywords: Beach House, swimming pool, waterfront, gulf views, quiet, secluded, bird watching, Horn Island, cottage. 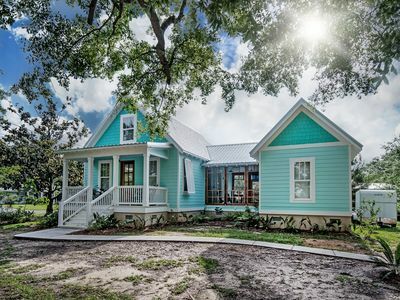 Whether you’re looking for an intimate setting for your family vacation, reunion, or small intimate wedding, you are sure to make lifelong memories with your family and friends at Seagrass Beach Cottage - a newly built home which sits on its own private beach on the Mississippi Gulf Coast near the quaint coastal town of Ocean Springs, Mississippi. 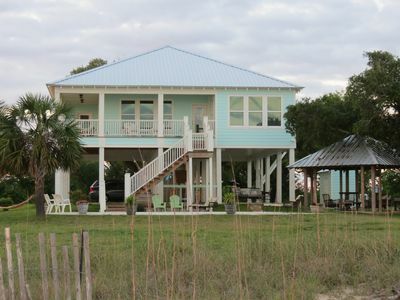 This spectacular 4 bedroom / 4 bath cottage-style beach house blends old Southern charm with modern amenities, including Direct TV, WIFI Internet, two flat screen TVs, central heat and air, tankless gas hot water heater and washer and dryer - to name a few. 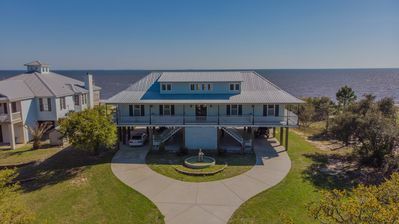 In addition to the 4 bedrooms and 4 baths, the spiral staircase in the living room leads to a Pelican Loft (used as a 5th bedroom) with French doors opening to a private sunbathing deck, with picturesque views of your private beach, the Gulf of Mexico, and Horn Island. Belle Fontaine Beach showcases the natural beauty of the Mississippi Gulf Coast like no other place can. 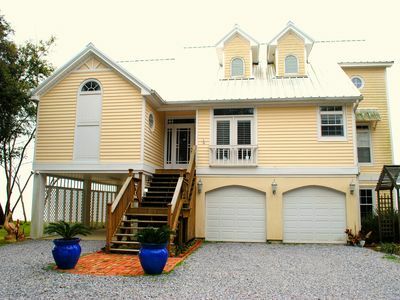 It's a beach front community with 2 miles of private white-sand beaches on the Mississippi Sound. 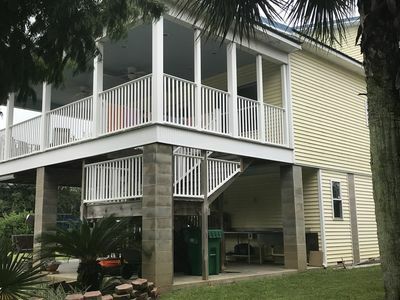 Features of the home include: * Wrap around porches provide plenty of outdoor entertaining spaces, including the large back porch ( 80' x 12’), which overlooks the beach and the Gulf of Mexico. * ADA-compliant elevator, with wheelchair lift for guests who require mobility assistance. * ADA-compliant accommodations includes a bedroom, with queen bed and private bathroom. * 3 Additional bedrooms, including 3 Queen and 5 Twin beds. * 4 full bathrooms * Separate sitting room with 2 additional fold-a-way cots * 2 separate laundry rooms, each with its own washer and dryer. * Built-in outdoor gas grill, bar, and 4-burner cooktop. * Children’s play area * Ample parking In addition to the beach, Seagrass is close to numerous opportunities for entertainment and recreation, including boat charter, fishing, kayaking, boating, and golfing. Seagrass is also located near Gulf Coast Casinos and cultural events, including the annual Peter Anderson Festival (Mississippi’s largest arts and crafts festival) and CRUISING THE COAST EVENT! If you’re a Boutique shopper you hit the Jackpot with our Downtown Ocean Springs District. With more than 200 local shops, galleries, restaurants and nightlife, the Ocean Springs community captures the small town charm with its walkability, white sand beaches, and year round activity. Contact us to find out more about this truly special beach house. We require a minimum 3-night stay for all bookings—but we imagine you’ll want to stay longer. If you’re interested in using Seagrass for your wedding, please let us know so we can discuss event rates. We look forward to hearing from you soon! Amazing Beach House-Get away from it all! 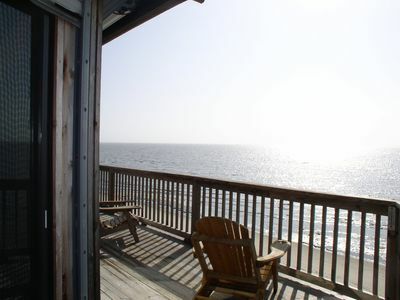 “Undisturbed, quiet, and peaceful” describes the setting of this beautiful gulf front retreat. The home is delightfully relaxing and beautifully furnished. Whether you bring your golf clubs, a fishing pole, or a good book, you are sure to enjoy your stay!! The lapping waves of the Gulf of Mexico are ten steps from your balcony where the only sounds you will hear are from the seagulls. You may even witness two crabs playing on the beach, but for sure you will be enchanted by the natural beauty of this property. This beach is in it's natural state, therefore we strongly recommend that you wear some type of foot wear on the beach. Although located seemingly miles away from civilization, this gulf front home in Ocean Springs is only 20 minutes from the casinos of the Mississippi Gulf Coast. For the shopper, there is a substantial commercial area (shops, restaurants, movie theatre, etc.) within a 10-15 minute drive. If golf is your game, you will be delighted to find the St. Andrews Golf Course two miles down the road. The home is furnished in sleek, polished décor. You may entertain friends and relax in the comfortable family room with plenty of seating. There is a 37” flat screen television in the family room which is equipped with Direct TV service (no network channels). Take in an unsurpassed view of the gulf on our balcony with outdoor furnishings just off the family room. Enjoy cooking a meal for your family in the gourmet kitchen. You will find all the kitchen gadgets and dinnerware needed in our fully stocked kitchen. There is table seating for six in the sunny breakfast area. The water is provided by a well resulting in occasional low water pressure. The master suite is elegantly decorated and has a comfortable queen size bed outfitted with luxurious linens. There is an outdoor balcony off the master bedroom and a master closet with ample space. The master bathroom is oversized and designed in contemporary Caribbean style. You will enjoy double vanities with granite countertops, a bathtub/shower, and plenty of space to dress. There are two guest bedrooms. One is playfully decorated with youngsters in mind. It has one twin bed ( with a trundle bed underneath) and a bunk bed with trundle. The room sleeps 4. The other guest bedroom has a queen bed and could serve as a second master bedroom. Both guest bedrooms have brand new, comfortable mattresses and fine linens. There is a tastefully decorated shared bathroom with tub/shower. An additional television for DVD use only is located in the second bedroom. Sea-Clusion Escape - The water front getaway you've been looking for! Come relax and unwind at the Sea-Clusion Escape home. 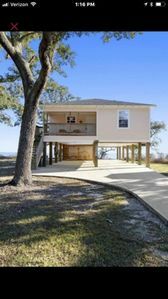 The house is nestled on a peninsula directly on the Gulf of Mexico. The sound of the gulf waves, pelicans passing, dolphin airings and birds chirping takes you to a far away place where you can reset from all the daily grinds. Sea-Clusion Escape offers the peace and quiet needed for a quick get away and a connection with nature. Swim, bike, kayak, the beach, fish, and crabbing are just the start of what this dream home offers. See you there! Come relax and unwind by the Shoreline of the Mississippi Gulf Coast in the historical city of Ocean Springs. Main living area is located on the upper floor providing an open concept that offers stunning views of the Gulf and pool area. A grand foyer welcomes you into your home away from home. Tropical decor and beautiful wood and brick floors throughout. The upper floor contains the kitchen, dining, living room, a split plan that offers a master suite with a queen size bed, glass french doors that open into your private sitting room overlooking the pool and the Gulf. Master bath offers two separate pedestal sinks with a large corner jetted tub between. Soaring ceilings, separate stand up shower and private toilet room. On the other side of the upper level you will find two guest rooms one with a queen size bed, a water view and double doors that lead onto the covered deck. The third room has two twin size bunkbeds suitable for your children. There is a full hall bath between the two guest rooms. A large covered deck off of the living room offers serene views and a calming breeze. On the lower level you will find a spacious laundry/wet room with plenty of counter space including a sink. This room leads to the pool area and can be very versatile. Feel free to spread out your food and beverages here and hang out by the salt water swimming pool. Also located on the lower level is a room with a queen size bed, fireplace and double doors that lead to a screened in patio beside the pool. There is a bathroom with a stand up shower perfect for rinsing off after a day by the pool. Please note that this is a gulf front home, not a beach front home. There are public beaches about 15-20mins away from the property. This property does not have a pier. There is a bulkhead that separates the yard from the gulf. This home provides various options for your stay here. 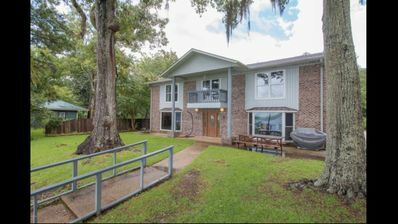 You can relax overlooking the Pascagoula river and watch as boats go up and down the river, or if you would like to bring your own boat and fish or explore the numerous bayou's within the river, you've got it all right here. The Pascagoula river is a beautiful river with lots of nature that you can enjoy. 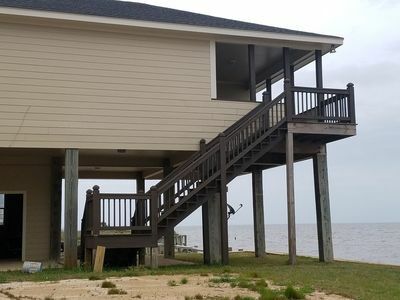 The master bedroom is very large with a gorgeous view of the Pascagoula river, and has a king size bed, and has two bathrooms. There are two guest bedrooms, both have their own private bathrooms. The guest bedroom that has a view of the river has a queen size bed. The other guest bedroom has two double size beds. There is also a full size futon upstairs overlooking the river as well. The house will sleep 8 in the 3 bedrooms but there are also 2 futons that can be used for sleeping too. One futon upstairs and one downstairs. There is plenty of seating for you and your guests. 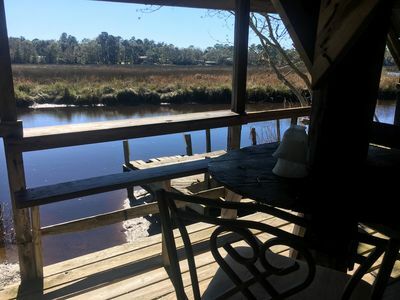 There is a large sectional couch in the den with a great view of the Pascagoula river that you can sit and enjoy your morning coffee watching as the fisherman speed by in their boats in front of the house. There is also a leather couch and a queen size futon in the living room if you need it for any additional guests. The dining room will seat 6 and their are 5 barstools, and there is an additional dining table located in the sunroom that will also seat 6 people. 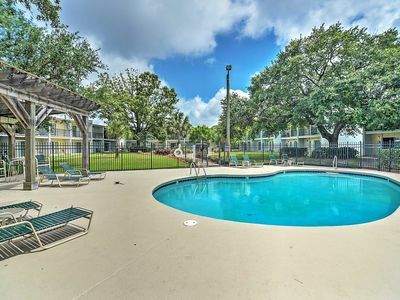 There is a full size screened in pool for you to enjoy. 2 Lounge chairs, 6 bar height stools and a small table with 4 chairs for you to sit around the pool and enjoy yourselves and still have the view of the river too. There is a boathouse for you to use with a 12,000 LB boat lift, fish cleaning station, and small refrigerator and a freezer inside the boathouse for any of your fishing needs.. This location gives you great access to miles and miles of fishing and also you can get to Horn Island in 30 minutes. Best of both worlds! Guests are sure to enjoy a memorable vacation in this fully furnished, 1bedroom/_1bath apartment. The main/master bedroom has a -king sized bed, The adjacent living room is furnished with a large sectional and a large flat screen tv. The kitchen is perfect for dining as it is equipped with stove, oven, microwave, and a dishwasher. Situated near the beach, guests can enjoy an afternoon of beach activities. 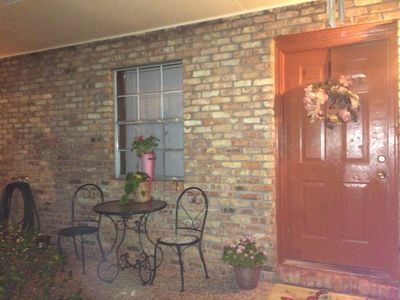 This two bedroom apartment is fully furnished and located in Pascagoula, MS It includes all furnishings and utilities. Wi-fi is available for an additional fee. It's a great location if you are vacationing or if you are here o work. the unit is located near downtown shopping, banks, and restaurants. You get so much more space in this fully furnished two bedroom apartment than in a hotel and a great rate. This unit has a king sized bed in the master and a full sized in the secondary bed room. 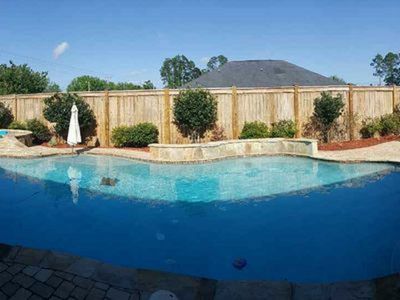 Ocean Springs Home with Private Pool! 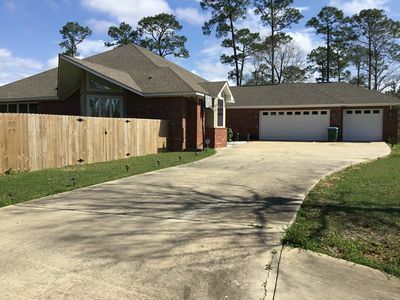 This gorgeous 3 bedroom 2 full bath home is conveniently located 15 minutes from Downtown Ocean Springs and the beautiful Ocean Springs beaches. The master bedroom has his and hers sinks with a stand up shower and a garden tub to ensure for a nice relaxing wind down after a day at the beaches, experiencing the nightlife of Ocean Springs, or hitting up the casinos. The enclosed, inground, private pool gives this home the ability to be a getaway without getting away with all the entertainment a pool provides. The pool has a nice size shallow built-in sitting area that has provided a special place for the handicapped or disabled. The kitchen is adorned with all-wood cabinetry and granite countertops for the highest quality environment for you, your family, and any guests. There is amble seating in the kitchen and dining room combined. There is wifi and cable on flat screen tvs in all three bedrooms and the living room. The huge walk-in closet in the master bedroom is suitable to hold as many clothes as necessary that you brought with you on your vacation or trip away from home. The master bedroom is privately located opposite of the other two bedrooms with the living room and hallways in between. The neighborhood is nice and quiet and will guarantee peace and relaxation. Come check out why Ocean Springs is the place to be on the Mississippi Gulf Coast, and rest and relax in this home away from home. The master bedroom has a king size bed and walk in closet with a master bath with a huge corner tub, separate sinks, and stand up shower. There is a guest bath and two additional bedrooms opposite of the master bedroom. One bedroom has two bunk beds sleeping four and the other bedroom has a queen size bed sleeping two. Come see why Ocean Springs is the place to be on the coast! Gulf of Mexico tropical oasis on Graveline Bayou across street from the Gulf in Gautier, Mississippi. Only 10 minutes to Biloxi casinos, golf, outdoor water sports, beaches, fishing and numerous seafood restaurants. Quiet area on deadend street to Gulf within 300 yards, a short walk. Catch fish or blue crabs in backyard. (Baskets/traps provided). Launch your kayak or canoe in backyard. Less than 1/4 mile from back yard to Gulf open water or explore the bayous. 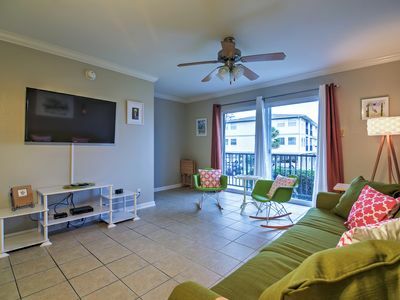 Sleeps 8 comfortably, completely remodeled with all new paint and updated appliances. 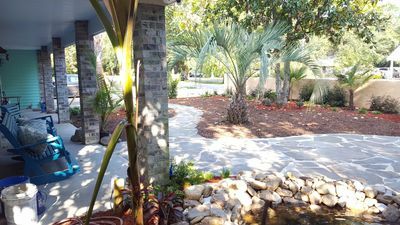 Beautiful tropical landscaped yard complete with cascading waterfall. $175.00 or $1000.00 week standard rates. Winter rates (November 1 through February 28) - $115.00/night or $700.00/week. “CONTACT ME FOR WEEKEND OR SHORTER STAY PRICING -The porch” in the south is the heartbeat of the home; A place for conversation, relaxation, and connection to nature. The tranquil view of Horn Island and the warm Gulf breeze is where your vacation begins. However, this house provides so much more! The 300 foot pier offers splendid daytime views of sunrise and sunset, pelican flight and dolphin sightings; and of course exciting nighttime fishing! Indoors provides a custom warm and cozy home, which can sleep up to 12. It is also a great place for 3 couples as each bedroom has its own bath. Ocean Springs has a quaint downtown area that is great for shopping, dining, and nightlife. Minutes away, across the Biloxi Bay there are many great Casinos for buffet and gambling needs. Don’t forget to take a mile and a half walk across the Biloxi Bay Bridge! •	3 Full baths w/ towels •	2 King, 1 Queen, 2 Twin bunk, 1 Queen sleeper or 2 large couches. w/ linens •	Washer and dryer •	Dishwasher/ microwave •	2 refrigerators •	ATT Uverse with Internet, 3 TV, DVD player Gas fireplace, BBQ pit, carport, waterside porch and patio, fish cleaning area on pier. 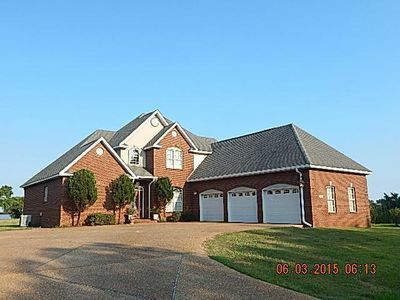 Gorgeous 3BR/2BA custom home blends Southern charm and modern comfort Ready to make memories? 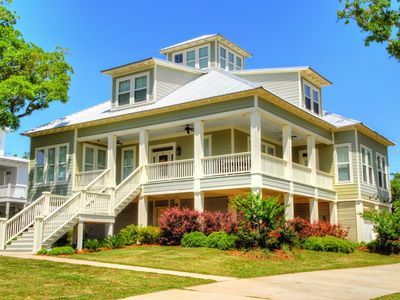 Sandhill Beach House in the quant coastal town of Ocean Springs, Mississippi is the perfect place for a romantic getaway, family beach vacation, small reunion, or even an intimate wedding. This beautiful custom-built home features airy interiors with modern amenities. Enjoy spectacular views of the Gulf of Mexico—and enjoy access to a 0.8-acre private sand beach — just steps from the oversized back porch. The 3-bed, 2-bathroom house offers a blend of old and new, with elegant furnishings, soaring ceilings, an open floor plan, and antique heart pine flooring. Features include: •	An elevator for guests who require mobility assistance •	Two queen beds, two twin beds, two roll-away beds, a Queen sleeper sofa with upgraded gel memory foam mattress, two sleeper chairs with upgraded Sealy Royale mattresses, and two regular sofas. •	A new kitchen with mosaic tile back splash, center island bar, and stainless-steel appliances, including drinks refrigerator and double oven •	Marble and ceramic-tiled bathrooms, with shower and tub facilities •	A full-length balcony across the ocean side of the house •	A back covered deck / porch with wicker furniture, built-in gas grill and bar •	Beach-side covered gazebo, with electricity •	Children’s play area •	Ample parking In addition to the beach, Sandhill is close to plenty of opportunities for entertainment and recreation, including wade or charter boat fishing, kayaking, boating, and golf. We are also located near the Gulf Coast’s 10 Casinos and cultural events, including the annual Peter Anderson Festival, Mississippi’s largest arts and crafts festival, CRUISING THE COAST EVENT! If your a Boutique shopper you hit the Jackpot with our Downtown Ocean Springs District. With more than 200 local shops, galleries, restaurants and nightlife, the Ocean Springs community captures the small town charm with its walkability, white sand beaches, and year round activity. Contact us to find out more about this truly special beach house. We require a minimum 3-night stay for all bookings—but we imagine you’ll want to stay longer. If you’re interested in using Sandhill for your wedding, please let us know so we can discuss event rates. We look forward to hearing from you soon! Make memories in this beautiful home on the Gulf! Witness the fantastic colors of the sunset from the 300 ft pier or from the comfort of the porch. This lovely three bedroom and two bath home can comfortably sleep ten. One of our favorite pastime is crabbing. We have small and large crab traps. The small ones are great for little ones to help pull up. At night, we enjoy going to the end of the pier and simply relax and listen to the sounds of the night. Of course Danny never misses the opportunity to cast a line. The crabs and fish don't always cooperate, but it never gets old trying. The town of Ocean Springs is as cute as can be so you won't want to miss seeing it! Of course if you want to try your hand at the cosinos, they are just a hope skip across the bridge. Great family getaway. Perfect for a larger group. Spacious 5 bedroom, 4 1/2 bath home with private beach. Front and rear balconies. Open kitchen plan, granite counter tops, side by side refrigerator with ice maker, dishwasher, microwave, toaster/oven, coffee maker, blender, pots and pans. Linens and towels provided. Main floor bedroom and full bath. Front and rear balconies. Terrific views. Swimming and beach combing. 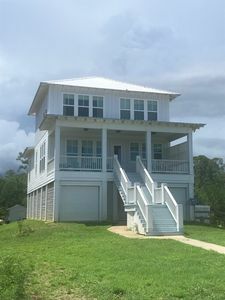 Our Island House is at the end of a private beach peninsula offering various views of the gulf, river side, lighted fishing dock & surrounding area. Here you won’t deal with traffic or a crowded beach. To the west, after watching the breathtaking coral sunsets over the water you can see the glistening lights of the gulf coast casinos. 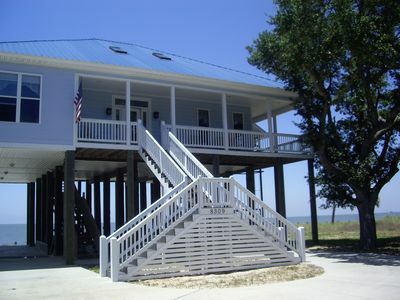 The front balcony faces the beach with additional views of the gulf to the west. 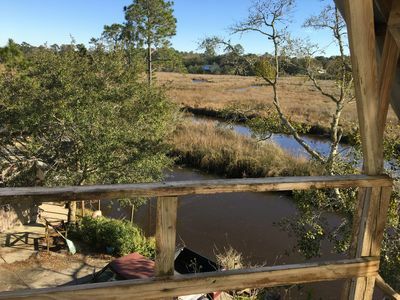 From our large back balcony you can enjoy the view of our fishing dock, fire pit seating area and surrounding marsh. The kitchen has a double oven, 6 burner gas stove with griddle and a double decker dishwasher. We also have a built in water purification system. The back balcony runs the entire length of the house. On one side of the back balcony is a screened in porch with a large outdoor dining table. The hot tub is at the other end of the balcony just outside of the master bedroom. We have a large master suite with a huge adjoining bathroom including a Jacuzzi tub, oversize glass shower, double sinks and private toilet. The crews quarters has 2 sets of “hanging” bunk beds, a futon with a plush comfortable mattress & flat screen tv. The 3rd bedroom facing the beach has a queen size bed. At ground level is our tiki bar “The Man Overboard” and gaming area. Gaming includes a pool table, ping pong, corn hole, blackjack, darts, croquet, horseshoes, air hockey and more. There’s free wi-fi and direct tv. The historic town of ocean springs is nearby with many quaint shops, restaurants and art galleries. It was one of the ten finalists in Coastal Living Magazine's 'American's Happiest Seaside Towns 2015'. If you decide to hang around the beach during your stay there’s an endless list of things to do. You can fish from the beach or sit on our dock and throw out a line. We also provide several crab traps and a large pot for boiling them. Crabbing from our dock is a 24/7 experience. For some exercise & adventure you can arrange for Amanda at 'Paddles Up' to deliver paddle boards right to the house. Or you can contact Captain Mike (our local favorite) for a boat tour around the river or he can take you to nearby Horn Island for some exploring. He offers various options. The Island House sits just across the narrow road from our private beach (not directly on the beach) and backs up to the river/marsh side so you’re not limited to just beach activities. Visitors return to this area year after year. Once you discover the beauty, nature and peace we offer....we know you'll get hooked too! Welcome to Sunset Pointe! 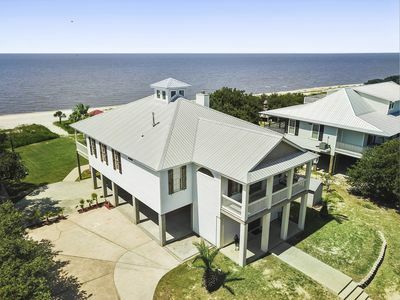 This charming beach house is at the end of a peninsula with wrap around water views of biloxi and the gulf of Mexico. Situated only fifty feet from the water’s edge this designer home offers peace and tranquility along with all the comforts of home. An elevator is provided for ease in handling luggage and groceries. Picture yourself sitting on the large screened-in back porch enjoying spectacular sunsets and listening to the sound of gulf water lapping the shoreline on your own private white sand beach. Should fishing be on your list of priorities by all means bring your pole. This untapped beach offers a variety of fish and crabs. 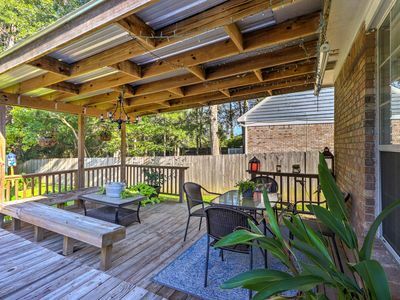 All this beauty and nature and amazingly this house is only twenty minutes from the picturesque downtown of Ocean Springs with its many restaurants and designer shops and twenty-five minutes from biloxi casinos, restaurants and night life. For golfers there are several first class courses nearby and for hikers we are only minutes from the Gulf Island National Seashore Park. For serious shoppers a prime outlet center is located forty minutes away in Gulfport. Cathedral ceilings with skylights in the living room provide a light and airy atmosphere. A 46” flat screen tv equipped with direct tv sits over a cozy gas fireplace. In the kitchen, granite counter tops and hardwood cabinets partner with a bay window breakfast nook where you can see and listen to the waves as you enjoy your meals. A separate dining room is available for more formal gatherings. The home has hardwood floors in the living room, dining room and kitchen. The master bedroom, guest bedroom, stairs and loft room offer plush carpet for comfort and quietness. French doors in the kitchen, living room and master bedroom add to the beauty of this home. The home is delightfully relaxing and beautifully furnished with everything you need for a worry free getaway. The master bedroom has a large private open deck facing the water. The master suite bath contains an oversized shower and a marble vanity offering his and her sinks. The toilet is in a separate room for additional privacy. The large walk in closet has built in dressers and clothes organizers. The guest bedroom on the first floor has a queen bed and walk in closet and lots of big windows. The nearby bath contains a tub/shower and decorative pedestal sink. A sky window offers additional light without compromising your privacy. All bathrooms in the house have tile floors. The loft room is equipped with a comfortable sleeper sofa. This “upstairs” room offers privacy and spectacular views from its many windows. A computer desk is set up here and wi-fi is available for all your electronic needs. This room has an adjoining full bath with tub/shower, marble vanity and closet. Crusin the Coast! Waterfront Home - Fish, Boat, BBQ, Sit Back, Relax & Enjoy! Gorgeous house by the river! Boat dock. Slip nearby. Plenty of parking for cars and trailer. Covered carport/patio area with table and chairs, gas grill and large stainless sink area. Walk up the stairs onto a covered deck with dining table and plenty of seating.. Perfect Home Away From Home. :) Located on the Beautiful Pascagoula River, the largest free flowing river in the US. Short Drive from Golf Courses, Nature preserves and other great activities.... or just relax and enjoy the view! 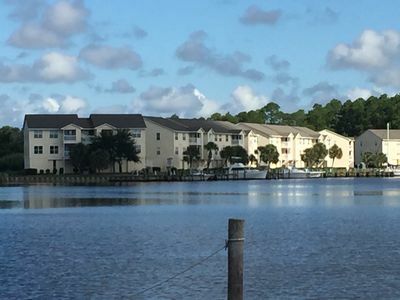 A beautiful and comfortable 2 bedroom, 2 bath condo with beautiful views of Simmons Bayou. 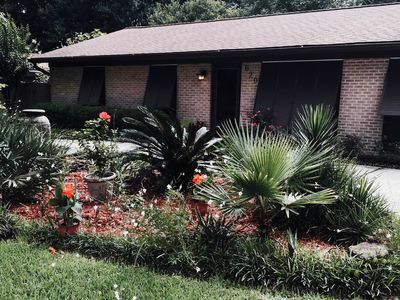 Located minutes from downtown Ocean Springs and near all the coast attractions. Light and fully decorated. Located on the top floor (2 flights of stairs, no elevator). Fully equipped kitchen with dishwasher, microwave, fridge with ice maker. Full size washer and dryer. This unit has it own boat slip and a boat ramp is next to the property. 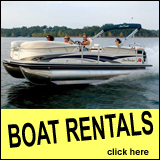 If needed the boat slip can be rented for an additional fee. Wonderful pool area with hot tub. Property has security and a gated entrance. Unit is on the top floor with stairs only. Parking is provided underneath the condo and in the open parking lot next to unit. Our unit has 2 restaurants next to it and you can easily walk to them. Enjoy a meal on their outdoor patio. 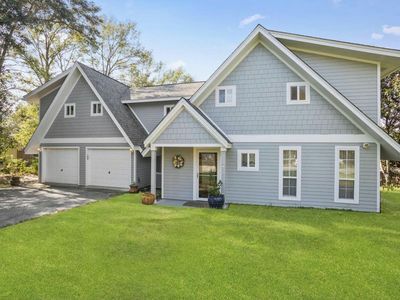 Only 5 miles to downtown Ocean Springs, and 11 miles to Biloxi. Get to any of the casinos in Biloxi with in 20 minutes. Fishing is allowed all around the boardwalk, unless posted as private. Bring your beach chairs! You’re going to want to watch the sunset! A beautiful and comfortable 2 bedroom, 2 bath condo on the marina. 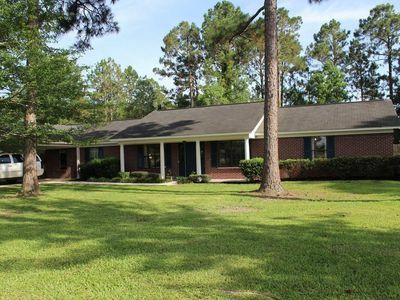 Located minutes from downtown Ocean Springs and near all coast attractions in Biloxi. Light and fully decorated. Located on the third floor (no elevator). Fully equipped kitchen with dishwasher, microwave, ice maker in fridge, and disposal. Full-size washer and dryer. A boat ramp is located near the property, but please note a boat slip is NOT provided with your rental. Wonderful pool area with hot tub. Property is gated and secure. Please note the unit is a third floor walk up. There is NO elevator. Parking is provided in the open lot next to the building. A quaint Bayou Bar and Grill is also located next to the property on the opposite side of the Marina. Ocean Springs is a small tranquil art community located next to Biloxi, MS. Downtown, bars, restaurants, art galleries, and The Walter Anderson museum are a 10 minute drive from the condo. Please, the rate is posted and you Must book through VRBO. No separate deals! Also, minimum age for rental is 25 years old. Also, must provide a copy of your photo ID 15 days prior to check in. 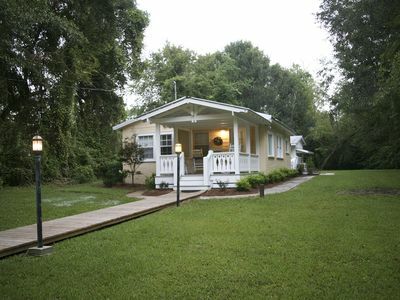 The Bayou Log Cabin is a genuine 1100 square foot cabin and located along the banks of Davis Bayou. 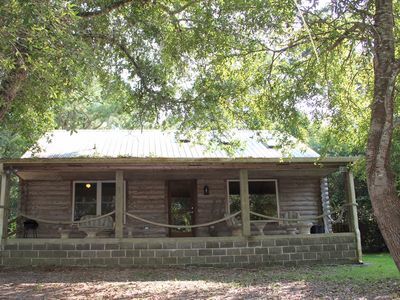 The Bayou Log Cabin is situated under live oaks on a quiet and tranquil bend in the bayou. It is nestled right next door to the owners' home at the back of a small neighborhood. Life at the cabin is easy and comfortable, much like a tall glass of iced tea on a warm summer evening. With its open and airy floor plan, you never feel boxed in, and with the full length back porch, you can sit and watch the wildlife of the bayou go about their daily routine. A drive of a few minutes will get you to any one of our downtown eateries or boutiques. Ocean Springs is home to many wonderful restaurants and bistros, such as Phoenecia Gourmet Cuisine, Leo's Pizza, BB's Poboys, Murky Waters, Mellow Mushroom, The Manhattan Grill, Chef Scott's Sushi House, Bayview Gourmet, Salvetti's Italian Grill, Mikey's on the Bayou, McElroy's on the Bayou, Cheryl's Steak House, and our Regis and Kelly and Food Network star barbecue joint, The Shed. In addition to the many wonderful eateries, Ocean Springs has boutiques for any price range. Quaint gift shops, pottery, jewelry, art, you name it...Ocean Springs downtown shops have it. We are an artist colony, after all! If eating and shopping aren't your cup of tea, visit the Walter Anderson Museum of Art, Shearwater Pottery, the Mary C. O'Keefe Cultural Center, or the Colmer Visitor's Center at Gulf Islands National Seashore Park. Golfing your thing? If so, the Mississippi Gulf Coast has several top rated golf courses. Gulf Hills, The Preserve, Shell Landing, Mississippi National, Sunkist, Grand Bear, and many other courses are available to suit your needs. If you want high rolling excitement, visit any of our many coastal casinos. For a treat that encompasses shopping, art, food, music, and companionship, come to Ocean Springs the first weekend in November for the Peter Anderson Festival, our Southern Living magazine top rated festival. There will sure be something for your liking. 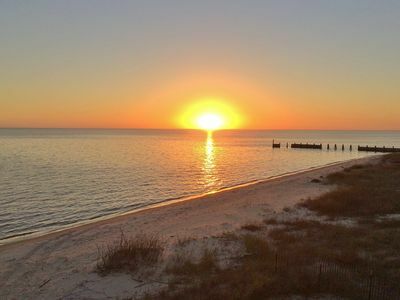 There is always something to do on the beautiful Mississippi Gulf Coast. Come and see what we have to offer and relax at the Davis Bayou Log Cabin. Waterfront paradise at your own backyard! Lovers of fishing and boating, and beautiful sunsets. Many unique features of this home include - A-frame living area with vaulted pine ceilings and walls, updated kitchen with stainless appliances, outside large porches for relaxing. Upstairs master suite with gorgeous master bath and large walk in closet has its own midnight bar and private back porch. Watch beautiful sunset from upstairs or downstairs porches. this home also has a full two car garage for your vehicles. Beautiful home, located on the Mississippi Gulf Coast. Sit on the front porch and watch nature in every direction. Less than 15 minutes to family friendly beaches, farmers market, downtown shopping or Gulf Islands National Seashore. The Sandhill Crane refuge is 4 miles down the road, our front porch is the perfect observation place for the birds. Feeling lucky, head to Casino Row in Biloxi and eat at one of the seafood buffets! New amenities, comfortable furnishings, beach accessories, and family games. Breakfast, check-in snacks, water and pantry staples are provided. Back porch dining, front porch relaxing, fishing in the private pond, cooking in the well equipped kitchen, watching a movie or just getting a good nights sleep are all possible at this location. 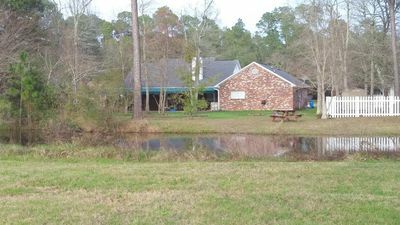 Property is on quiet dead end street 5 miles from exit 57 or exit 61 off I-10 in the Vancleave community of Jackson county. The home was completely remodeled in 2018. 12 miles to Downtown Ocean Springs, 15 miles to Casino Row, 24 miles to Keesler AFB, 20 miles to The Chevron Refinery, 13 miles to Ingalls Shipbuilding, Owners are locals, many add-on options are available with this property: Grocery Delivery Meal Preparation Excursion Booking Airport pickup and drop off Childcare Event Hosting Need something not listed send us a message! PERFECT GET AWAY RETREAT The living is easy in this impressive, generously proportioned contemporary residence with an antique americana feel, located within a quick stroll to Old Ft. Bayou and a boat public launch. The floor plan encompasses three bedrooms with plenty of room for study, sleep and storage, two bathrooms, and a sleek and stylish kitchen that flows through to the dining room and private rear patio. Perfect for a family or as a holiday retreat, this home is ideally positioned to enjoy the proximity to beaches, cafes and restaurants, shopping center, and a selection of premier schools. Splendid 1BR Ocean Springs Townhome! Beautiful 3 bedroom/2 bathroom home with an open split bedroom floor plan available for your enjoyment, master on one side, 2 guests rooms on the other side. Internet WiFi provided. 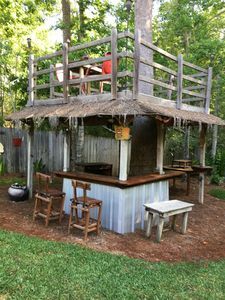 Amazing private fenced backyard with several areas to entertain on the deck that include a fun Tiki bar and fire pit area with rustic custom built seating. You will love the sound of the birds chirping and the trains passing as they rumble through this beautiful Gulf Coast town. There is a charcoal grill available for guest use on the back deck. Ocean Springs is truly a City of Discovery. It was founded in 1699 and is rich in history, delicious cuisine, culture, the arts and tradition. The beaches are convenient as well as the nightlife. Downtown Ocean Springs is only 2 miles away and we are walking distance to the Greyhound stadium, Starbucks and Rouses Grocery. There are several options for food/grocery pick up and delivery while you are visiting. Walmart Grocery online pick-up service as well as phone app Shipt that delivers from Rouses, Winn Dixie, Target and CVS. Door Dash and WaitR apps for restaurant delivery. We are only 1-1/2 hours from New Orleans LA and Gulf Shores, AL. We have provided a Guest Book that includes the House Rules with wifi instructions, check out procedures, etc. It also includes many recommendations for sight seeing, dining out, shopping and exploring. Bring your bikes for a wonderful way to enjoy our city. 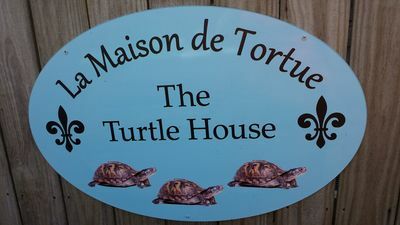 Welcome to Turtle House, a unique Carroll B. Ishee designed home nestled in the woods near East Beach in Ocean Springs. With its angular roof lines, large expanses of glass, different floor levels and decks on three sides, the Turtle House invites guests to be attune to nature. 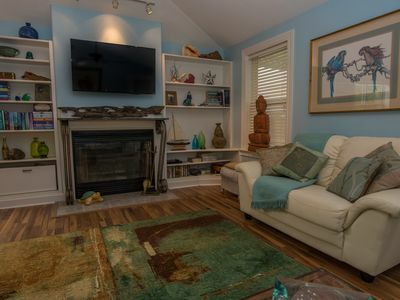 The 2 bedroom, 2 bath house offers a peaceful retreat yet is close to East Beach, Gulf Islands National Seashore, USM-Gulf Coast Research Laboratory and downtown Ocean Springs, a place that has received many national accolades for its livability and beauty. With the decks and back yard, the property is secure for children and pets. The house has room to sleep 6, but plenty of interior and exterior space for entertaining, including an outdoor grill and wet bar. Located on a paved dead-end street, there is enough parking for even the Cruisers. The home is very comfortable for couples and families, and we love pets. 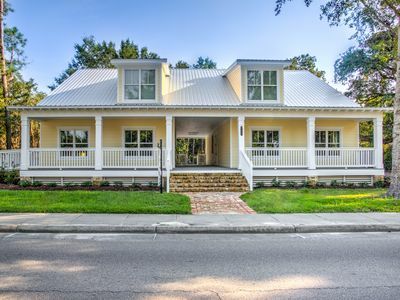 4 bedroom (2 king beds, 2 queen beds)/3 bathroom beachfront home located on East Beach in historic downtown Ocean Springs, one of only 3 Great American Main Street Award Winners in the United States! Ocean Springs is a charming, progressive, and quaint beach town located on the Gulf of Mexico approximately 50 miles from Mobile, Alabama and less than 100 miles from New Orleans, Louisiana. For anyone who enjoys the beach there’s sun bathing, kayaking, paddleboarding, and fishing to name a few. Downtown Ocean Springs offers plenty of shopping and dining including clothing boutiques, candy and toy shops, and everything ranging from casual to fine dining. The house is only about 50 steps from the beach (locals call it “East Beach”), 5 minutes from restaurants and bars, and 10 minutes from the casinos (Beau Rivage, Golden Nugget, Hard Rock, etc.) which are located just across the Ocean Springs Bridge. We are happy to provide our guests with a full guide to get you acquainted with the area and are available to answer any questions you may have about specific interests. The Cottage on the Square is located off a main downtown street down a gravel lane that leads into a small cottage community. Very private, with little to no traffic. From the front porch to the deck under the big oak tree, the charm of The Cottage will welcome all visitors. WHEEL CHAIR ACCESSIBLE A great place for a family with any age children, a girl friend get a way or two couples enjoying a weekend on the Coast. WHEEL CHAIR ACCESSIBLE. We offer a queen size bed with a select comfort mattress (dual control), twin bed, and a full size sofa bed. Spacious deck with a ramp for anyone needing assistance. The kitchen is fully stocked for a chef, (my husband is a fabulous cook) with all cooking supplies and appliances. Dishwasher, stove, microwave, washer and dryer for your convenience. Parking for one car in the back by the deck with more parking in the front. We have great outdoor lighting, fire pit if you love the outdoors. Downtown is minutes down the street with great restaurants, bars, and the best shopping on the Coast. Be sure and enjoy the wharf and catch a shrimp boat coming in with fresh shrimp. The beach is only a few blocks away. Ocean Springs is known for its museums, art, and shops down the tree lined streets. Magazines and brochures provided for your fun! Liliiflora Cottage is a privately owned modern “dogtrot” style vacation home. The home is newly constructed (2015) and is provisioned with all of the necessities and conveniences to ensure a comfortable stay. The “Dog Trot” design allows each of the two bedrooms to open onto a large screened breezeway, which is great for sleeping with the doors and windows open on cool nights. The porch is a great place to relax in one of the hanging hammock chairs and read a good book. The main house has vaulted ceilings, a full kitchen, half bath, laundry and a living area with flat screen TV and wireless internet. Two "Beach Cruiser" bikes are also available for guest to use. Liliiflora Cottage is conveniently located within a five minute walk to East Beach and only a Five minute bike ride to Ocean Spring’s charming downtown area. Downtown Ocean Springs is host to the famous Walter Anderson Museum and the Mary C. O'Keefe Cultural Center, you’ll also find unique shops, art galleries, museums, the best restaurants on the coast and lots of friendly people. There is almost always something going on downtown, farmers markets and festivals during the day and plenty of night life with great live music at night. The Inner Harbor is only a couple of minutes away and is a great place to buy fresh shrimp right off the boat or book a fishing trip to the barrier islands. The area offers plenty of great fishing that is easily accessible if you prefer to bring your own boat (parking available on site). Shearwater Pottery is just east of the harbor and is an interesting place to stop in. Just a little further up the road is Front Beach. Here there are sandy beaches, picnics tables, bonfire pits, and a community fishing pier. Ft. Maurepas Park is located just across from Front Beach, which is a great place for younger children. There is a new splash pad, playground equipment and a covered picnic area. The parks amphitheater is often host to concerts and other events. Further west is the Ocean Springs/Biloxi Bridge, a very popular and scenic place for walkers to take advantage of the nearly two mile pedestrian walkway over the Mississippi Sound. On the other side of the bridge, Biloxi offers plenty of Casinos and restaurants, the world famous Ohr O'Keefe Museum of Art, the Maritime and Seafood Industry Museum, Beauvoir (The home of Confederate President Jefferson Davis) and the newly opened MGM Park (a 5,000+ seat baseball stadium that is home the Biloxi Shuckers). Ocean springs is also a great jumping off place for a day trip to New Orleans, which is only about 90 miles away, or to Mobile and Dauphin Island, 50 or so miles away. Contact owner for weekly and monthly rates. 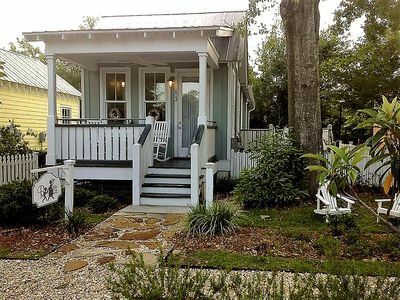 BOOK NOW FOR CRUSIN' THE COAST AND PETER ANDERSON FESTIVAL "Camellia Cottage on Government" is the most beautiful and newest edition to Ocean Springs' vacation rental community. Built in the 1930's and recently totally renovated and landscaped. It is ready to host a family, couple's getaway, or girls weekend for up to 6 people. Camellia Cottage is set away from the street. As you cross the covered bridge on the boardwalk, you will enter a peaceful and serene property. Very secluded. 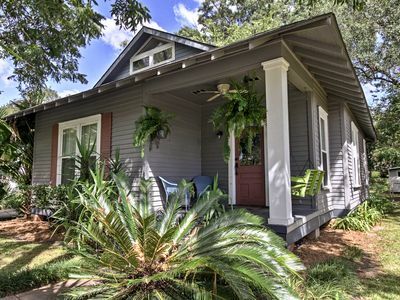 "The Garden Retreat" is located in Old Ocean Springs on a quite cul-de-sac street. It has mature trees & gardens in the front & backyard. An all weather back porch for relaxing over looking the serene scenery. The Back Yard is Privacy Fence which is great for children & your privacy. There is parking for 4 vehicles in front. A boat or car can be parked behind the privacy gate. The Master Bedroom Suite has a Queen Size bed; the Middle Bedroom has a Queen Bed & the third bedroom has a trundle couch with two twin beds. It sleep 6 people in 3 bedrooms. All the furniture & Mattresses are new along with the TV & décor. Cable & Hi Speed Wi-Fi are provided. The Kitchen is fully equipped with complimentary coffee & tea. A Stainless Steel Grill is just outside under a Pergola. There is an outdoor patio with table & chairs for outdoor enjoyment. You can walk down Government Street which has many small restaurants & shops. Nearby Washington Ave., downtown in Ocean Springs, is tree lined with old oak trees, shops, restaurants & the Walter Anderson Museum of Art. The house is approximately 1.5 miles from Front & East Beach in Ocean Springs. It's just a short drive across the Biloxi/Ocean Springs Bridge to Biloxi which has 6 Casinos & a 26 mile beach for fun & activities. Check out our many recommendations for places & restaurants to visit while you are staying in Ocean Springs, a quaint village located on the MS Gulf Coast. We have made our Garden Retreat Home a Tranquil Place for Your "Home Away From Home". Thanks for Visiting us! Rose & Gary Horman, Owners & Local Natives.